There is a definitive wave of application migration happening from Lotus notes to SharePoint Platform. These initiatives are usually cost and time consuming. Clearly formulated strategy implementation from day one is needed for long running benefits. Please note that SharePoint Platform journey for end users should start well before LN apps start appearing there. SharePoint institutionalization is the key to success, even before first app is migrated. Don’t try to build LN look alike apps in SharePoint, since these platforms are entirely different, you will end up spending lot in this desire. Always think from SharePoint perspective than an existing Notes apps. LN will be around for some more time, it takes time, it’s not overnight job, so please be prepared to support both the platform for sometime. Think cohesively for all business stakeholders including Partners, vendors, remote users, global users, multilingual users – so that all can participate, maintain and share information effectively. Understand the pain areas and try to address them effectively even by changing business process to improve productivity. Also Please note that every Notes app need not be migrated to SharePoint, always check feasibility. Some apps may remain there or some may be developed using ASP.NET/Java frameworks or even SaaS route. Take a chance to improve and standardize application portfolio using Industry best practices. It is your golden chance to reorganize. Application which can easily be migrated to OOB feature of target platform. Sometimes Business critical apps are taken first for taking first come advantage, this can help set credibility of the platform. However, judicious decision can only be taken after detailed assessment and listening point of views of different stakeholders. Meeting with stakeholders and understanding their expectations should ensure success of migration exercise. Effective Governance practice to control performance degradation because of content growth. Generally, the larger the number of people who get information from a particular type of site, the more tightly it is governed, and vice versa. 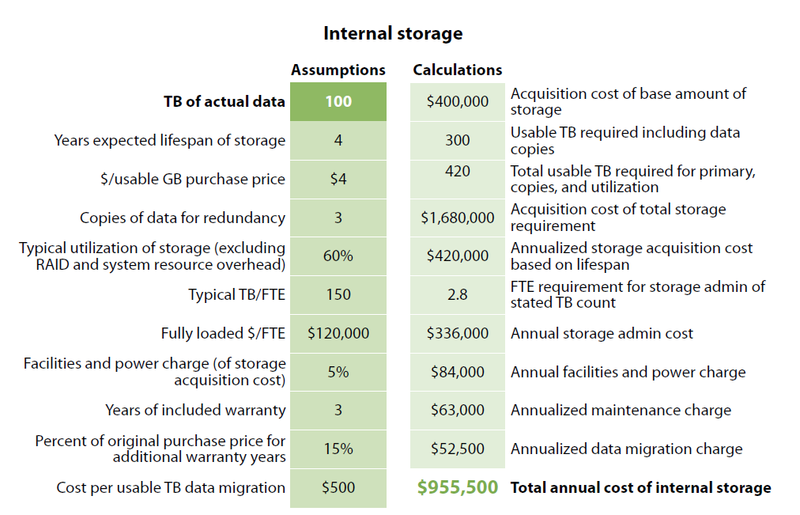 Focus on Reuse and standardization by leveraging consistent Framework, Tools, products. Proper Migration Assessment paves the road to success, allow sufficient time to accomplish this activity. Work closely with ERP, this can give enormous power to users where information is available in SharePoint which is controlled and secure. Devise a strategy on maintaining and sharing Master data between applications and portals. Future-proof organization with Mobility, build some apps to be usable on mobile devices. What areas of the business offer the most opportunity for growth? – Act in that direction, from both Migration and SharePoint Platform adoption perspective. As far as possible, target using Out-of-the-box feature of SharePoint, this may lead to cost saving and ease of maintenance in future. Achieve more and more things using SharePoint Client side object model, this will keep your SharePoint upgrades lighter(low cost). Please note that, Not everything to be achieved in SharePoint, consider cost-benefit analysis and don’t hesitate to look for some third party product on Microsoft technology which can replace some Lotus Notes applications, even some times some business processes can be moved to ERP. Hope this will help anybody going migration route. One more white paper written by me is published on Company web site at below location. 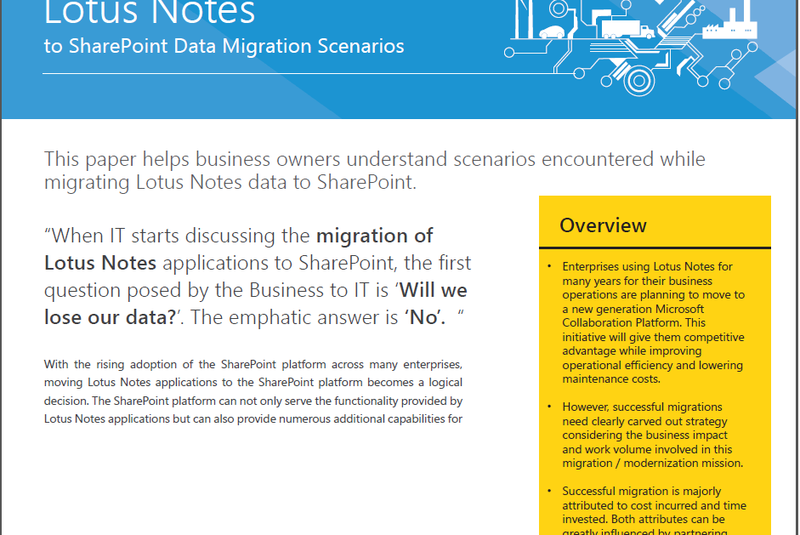 This is about migration scenarios while migrating Lotus notes applications to SharePoint platform. Below is little glimpse of first page, for full read, please access above link.